SALT LAKE CITY (AP) — Tesla’s push to sell its all-electric vehicles in Utah hit another roadblock Monday when the state Supreme Court upheld a decision by Utah licensing officials to deny the automaker a license to sell new cars. Tesla had argued that a state law barring car manufacturers from owning dealerships didn’t apply to the company. Tesla sells its cars directly to customers rather than using independent dealerships, something Tesla attorneys argued is vital to their business. Tesla must sell its own cars because a sale depends on convincing customers that electric cars are better than those with a gas engine. The company also argued that Utah law doesn’t block car makers from selling directly – it only blocks car makers from owning a dealership that’s set up as a franchise. In the decision Monday, Supreme Court justices didn’t address whether Utah law blocks a car maker from selling its vehicles directly or whether it’s vital for the car maker to sell its own product. In a statement, Tesla said the ruling was “disappointing for Tesla and all Utah consumers interested in consumer choice, free markets, and sustainable energy.” The company said it will pursue all options in Utah, including working with the Legislature, and will continue offering service in Utah for Tesla cars. Tesla has said that law protects a monopoly by locally powerful car dealerships and violates free-market economic policies in Utah’s constitution. An effort to try to change the law earlier and accommodate Tesla failed in Utah’s Legislature earlier last year after the company pulled its support, saying the fix wouldn’t allow it to keep any inventory in the state. Unable to sell cars through its $3 million showroom in Salt Lake City, Tesla instead decided to take its fight to Utah’s Supreme Court. I am sure those folks who are willing to spend near $100K for a new Tesla will find it only modestly inconvenient to fly to Las Vegas to pick up their pre-ordered car and drive home. The paperwork for UT registration is pretty simple, and the state gets its sales tax. Perhaps Tesla erred in thinking their powers of persuasion would work, without the help of “lobbying” the state legislature. I’m not sure a state should have the power to tell a company how it must sell its cars. This is idiotic. I can see not allowing the manufacturer to own a dealership AND have other individual-owned franchised dealerships as well. That is a clear conflict of interest and the non-manufacturer owned dealerships would get the short stick every time. But this is entirely different. What’s the problem? Free market capitalism seems to have hit a bump in the road. 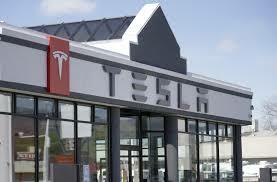 Tesla could force anyone in becoming a franchised dealer. Perhaps our friendly local Ford/GM/etc dealership doesn’t want their manufactures to get any ideas. Tesla isn’t forcing anyone to become a franchised dealer. Quite the opposite, they want to own their own dealerships. This is no different than the Apple Stores. Why doens’t Utah outlaw them as well, and force everyone to buy their Apple products at Simply Mac, etc? Why? Because everyone would realize how stupid of an idea that is! It’s no different just because the product is a car. If Tesla wants to sell and service their product directly, why on earth can’t they? When they are referring to the independent dealers, do they mean like Ken Garff Ford that owns a monopoly of dealerships that prevents a competitive free market because customers don’t have anywhere else to buy a Ford unless they drive to Vegas?